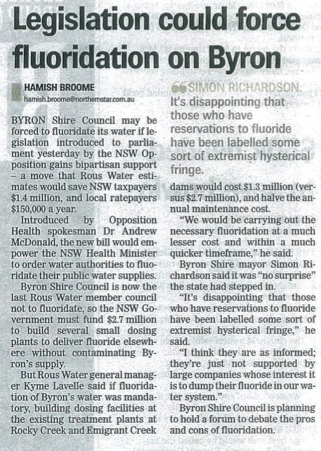 Byron Shire is set to decide if it will put fluoride in its water supply. The issue of fluoridating our water supply has again hit the news. Up front, I think it is vital that, when we as a community discuss emotive issues such as fluoride, immunisation, or any issue that considers our health, especially that of our children, we do so with respect of opposing views and with a healthy, informed debate. I support Council’s current policy not to fluoridate our water supply, so any changes to this will have to come from the group of pro fluoride advocating Councillors. Recently, Council has resolved to hold a workshop, whereby an hour will be given to fluoride proponents, an hour to those opposed to the mass dosing of fluoride in our water supply and an hour for Q and A. This session is for Councillors to listen, learn and become informed. On October 16, there will be a public forum at the Byron Community Centre for members of the public to share concerns, information, and listen and learn also. There are way too many components to this discussion, so i’ll stick with a couple. I support our position because the impact of fluoride goes far beyond just its affect on teeth. Regarding teeth, In NSW, disadvantaged and low income people have significantly worse oral health than the general population and they have the greatest difficulty accessing dental services. If we care about dental health it is vital we provide more free dental care than just the incredibly busy clinic in Mullumbimby. It is also vital we provide prenatal education for expecting mothers- these measures would have huge affects on our collective dental health. As recently outlined by pro-fluoride advocates speaking at the recent Lismore Council meeting, fluoride of drinking water likely increases the proportion of caries-free children by approximately 15%. Couldn’t more education, fluoride enamel and accessible dental health clinics more than match that figure? In fact, one resident proposed that we should, “request the Health Department spend the dosing plants $1,500,000 cost on a dental facility at our new proposed hospital, and spend the annual $300,000 cost on equitable public dental treatments. Fluoride only works in direct contact with teeth. As 99.9% of fluoride in mass dosing goes down the gut, toilet, shower and garden, the annual $300,000 budget would supply a yearly direct application fluoride treatment at the hospital dental clinic, for every child in the Shire.” Rather than spend large amounts of ratepayers funds, I’d rather advocate for the measures just espoused and highlight to parents ways to enforce parental responsibility by considering such products like Nutrafluor by Colgate that can be purchased either from the supermarket, chemist or dentist depending upon the potency. Fluoride’s effectiveness is also highly contestable. Recently, Dr Doug Everingham, Australia’s Health Minister from 1972-75 emailed, ”As a family doctor in the 1950’s, I supported fluoridation in published letters. I have since found that surveys throw ever more doubt on official claims. Surveys on Fluoridation found to it to save some teeth, but not as many as applying fluoride to tooth enamel, or other dental hygiene improvements. More significantly, bone malignancies and other long term effects, worse than tooth decay, are increasingly linked to fluoridation in surveys by clinical epidemiologists, as distinct from public administrative experts and commercial fluoride interests.” Finally, Byron Shire, rather than being the radical black sheep refusing fluoridation, is actually in step with the rest of the world. As Israel decided to de-fluoridate their water just last month, they join an overwhelming number of countries that do not fluoridate, including 97 percent of the European population. Tellingly, there is no difference in tooth decay between western nations that fluoridate their water and those that do not. Only 9 countries in the world have more than 50% of their population drinking fluoridated water. In fact, over half the people in the world drinking fluoridated water live in the U.S, though that may change as within the past several months, for example, Portland, Oregon; Woodland, Washington; Wichita, Kansas, and many other towns and cities across America and throughout the world have decided to end their water fluoridation programs. of adding fluoride to our drinking water for our own good. As soon as possible I will be moving from Melbourne To Byron.